fences and metal barriers were installed. Races were held for two years, but none have been held for a period of seven years or more. Automobile races were held in conjunction with the fair at Fairgo, but not on a regular schedule. Motorcycle races were also held at this race track at various times. Both automobile and motorcycle races were held at the Tri-State Race Track in the South End. In the 1920's, motorcycle hill climb races were held at Nave's Crossroads. Since then, events have been held at other locations. A local man, Ed Cosgrove, is this year a national motorcycle champion racer. Motorcycle events are held at the Cumberland Fair Association track during fair week. Automobile racing is also held at the fair, but in the form of a demolition derby. Automobile racing is very popular in the Bedford and Hagerstown areas. At the present time there is a motorcycle racing track on the McMullen Highway in the Rawlings area. On September 14, 1925, at two o'clock in the afternoon, Carl Zimmerla, a native of Cumberland, started from the Treiber Electric Company on North Centre Street in a Durant Roadster in an attempt to establish a new world's record for the continuous operation of an automobile. The record was 124 hours held by Carlyle Blackwell. 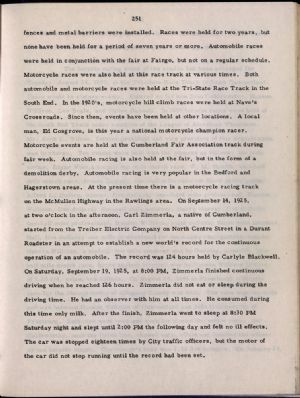 On Saturday, September 19, 1925, at 8:00 PM, Zimmerla finished continuous driving when he reached 126 hours. Zimmerla did not eat or sleep during the driving time. He had an observer with him at all times. He consumed during this time only milk. After the finish, Zimmerla went to sleep at 8:30 PM Saturday night and slept until 2:00 PM the following day and felt no ill effects. The car was stopped eighteen times by City traffic officers, but the motor of the car did not stop running until the record had been set.